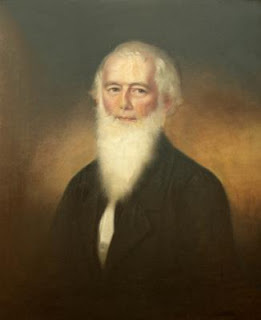 Portrait of Edward William Johnston by Sarah Miriam Peale (circa 1860). Original at University of Missouri - St. Louis / Mercantile Library. I've been working on the family of Joseph Eggleston Johnston (1807-1891) for a long while. Anyone who would like to correspond about this research or exchange additional information, please email me at efrance23@gmail.com. Edward William Johnston, b. October 17, 1799, Prince Edward County, Virginia. Family of Peter Johnston, Jr. (his father) moves to Abingdon, Virginia, in 1811. Edward educated in part at home and probably elsewhere, but still looking for more information on this. Marries Estelle Villagrand(e) Costar of Saint-Domingue (Hispaniola/Haiti) I believe in New York City on February 7, 1824. I once came across tantalizing references to her possible connection (including correspondence) with Pierre Toussaint (1766-1853), a freed slave who came from Haiti to New York City and became known for his philanthropic work, now being considered for canonization by the Catholic Church. Moves to South Carolina and works variously as librarian, editor, instructor, "professor of history and belles letters," tutor and intellectual. 1832, Board of Trustees meeting on December 11, 1832: Edward W. Johnston elected Teacher of Modern Languages. See M. LaBorde, History of the South Carolina College: from its incorporation December 19, 1801 to Nov. 25, 1857 (1859), p. 158. John B. Floyd, class of 1829 (p. 442). Benjamin F[ranklin] Johnston [Edward's brother] and John Preston, class of 1830 (p. 442). Involved in Nullification Crisis as newspaper editor, etc. His brother Algernon Sidney Johnston equally involved. Works on Southern Review and Southern Literary Messenger and knows Edgar Allan Poe. Completes first edition of Catalogue of the Library of the South Carolina College using the "Baconian system of knowledge" . . . "placed under analytical arrangement" (Columbia, South Carolina: Telescope, 1836). Disastrous attempts at running schools in Virginia (with Estelle), including the Roanoke Female Seminary at Botetourt Springs, formerly owned by his uncle, Charles Johnston. Site of Hollins University. Washington Independent, 1841. Works briefly at post office, Botetourt Springs, 1842. Has become a Whig at some point. A plethora of published writing throughout the 1840s and well into the 1850s via newspapers in Washington, D.C., Richmond, Virginia, New York City, and St. Louis. "American Letters -- Their Character and Advancement" (as Il Secretario, a nom de plume he often uses throughout this period) in The American Whig Review, Vol. 1, Issue 6 (June 1845): 575-581. Works on Alexander Hamilton’s papers, published in 1850. Fights duel with John Moncure Daniel, 1852. Anecdotes of Winfield Scott as Soldier and as Citizen (Washington, D.C.: Daily American Telegraph, circa 1852). Articles on Patrick Henry and Madison in Homes of American Statesmen (1854). Arrives in St. Louis to work on the St. Louis Intelligencer in 1855. Also works on St. Louis Leader at some point. Librarian for the St. Louis Mercantile Library Association, 1858-1862. Completes Catalogue, Systematic and Analytical, of the Books of the Saint Louis Mercantile Library Association (1858) and A Guide to the Sculpture, Paintings, Coins, and Other Objects of Art, in the Halls of the St. Louis Mercantile Library Association (1862). Forced to resign during the American Civil War for failing to renounce pro-Confederate sympathies. Dies in St. Louis on December 9, 1867. What happened to Estelle Villagrand(e) Costar Johnston? More notes in process, including on additional specific articles as Il Secretario.